Runners and non runners alike will likely have heard of this condition. 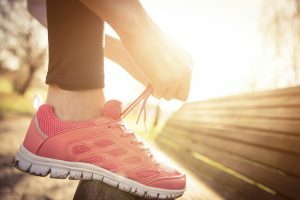 Plantar fasciitis (PF) is a common affliction in runners between 35-55 years of age. It presents as pain or burning in the foot and heel, and can be especially bad for those first few steps in the morning. It can be very limiting to the training program of beginner and experienced runners. Most people are aware of the fact that the structure of the foot can cause foot pain and many have gait (manner of walking) analysis, foot assessment and orthotics made, but what about other causes that come from above the foot, higher up the chain? One well publicized factor is a lack of upward bend in the ankle called – dorsiflexion. It is often related to tight calf muscles. The foot will often compensate by rolling in and this puts excessive loads on the plantar fascia. This can limit how far the hip can extend backwards which in turn prevents the calf and ankle getting the adequate lengthening they need. A strong powerful gluteus maximum muscle stabilizes our gait and is crucial in propelling the body forwards in walking and running. The little brothers of the gluteus maximus, they are just as important as their big brother. If these are weak or not switching on enough you might see the hips rocking from side to side excessively. This affects what goes on at the ankle and heel lower down the chain. Now I bet you’ve been thinking about these limitations being on the same side as the plantar fasciitis but the limitation can actually be on the other side. For example, a tight left hip flexor can cause plantar fasciitis in the right foot. Why? Because the left leg needs to propel the body forwards enough so that the right leg (in contact with the ground) ends up with the hip extended. This is because a muscle needs to lengthen for it to take the load of the body before it can fire, an easy example of this is if you ask someone to jump up in the air as high as they can, they automatically squat down before they jump upwards without thinking about it. This is the body’s way of loading up the big powerful gluteus maximus muscle to propel you high up into the air. Another example of this is throwing a ball forwards – the arm will automatically be drawn backwards to load the trunk and arm muscles before it is gets propelled forwards. If the plantar fasciitis is on the right foot the core needs to be strong in controlling trunk twisting to the left because of the knock on effect this has down the leg on the ankle and the foot. This is probably the least considered cause of plantar fasciitis. Stiffness in the mid and upper back is common in people who sit at a desk for long periods of time, also in cyclists and weight lifters. Twisting and rotation is very important to this part of the body. If the trunk lacks twisting and rotation, the core muscles will not fire as well. This uncontrolled rotation can have a knock on effect all the way down the leg and overload the plantar fascia. If you have given orthotics and insoles a really good go and you are massaging your poor foot endlessly and only getting short term relief you might want to consider one of these less thought of causes of plantar fasciitis.